Original hardware including lock (original key present and included). A great antique for any collection. 19th Century English Double Tea Caddy. Exquisite tea caddy found in England last year. The spot in top in photos is the mirror reflection. No cracks, chips or defects. Inlay on beautiful wood! Excellent workable condition. No key. Measurements 5 1/2” wide, 4 1/2” high, 4 1/2” depth I am always happy to answer your questions. For your consideration, a charming antique carved wood polychrome santos figure of Jesus, likely 18th to 19th century Spanish Colonial. Age related wear noted in photos: missing limbs, paint loss, and cracking to wood. Measures 10 1/8 inches in height. 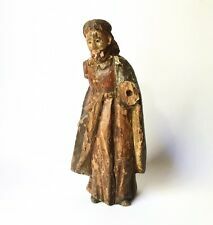 European Medieval STYLE Carved Wood Statue of a Bishop Clergy ca. 18-19th c.
I am totally into antique artifacts & paintings. coming into being??. (Credit Cards). PRODUCTS ARE EXACTLY THE WAY THEY APPEAR IN THE PICTURES. THIS INCREDIBLE BOX LOOKS FANTASTIC ON DISPLAY AND IS STILL GREAT FOR STORAGE. LOCK DOES NOT APPEAR TO WORK. MAKER'S MARK: UNSIGNED. If we could only know who the people were over the past almost 200 years who used this tea caddy! The bottom has a worn, grain-painted finish while the top has original dry varnish: the halves are joined by fancy hinges and closed with brass hook latches. You will note a shrinkage crack in the heavy end of the bottom and it retains its original wrought brass carrying handle. Antique Early Walnut Dresser Document Box 1800S. This is a great early antique walnut dresser/document or sewing box in beautiful condition handmade and dovetailed very well-made with key and lock and hinged leg it is about 11 1/4 inches long by 7 1/4 inches wide and 7 1/2 inches high weighs about 5 pounds this is a Beautiful trunk box shows very little wear top of the lid is burled walnut see photos sold as found we ship fast thank you for looking. ANTIQUE Carved Eagle American Folk 26 1/4 Wingspan Beautiful Estate find. No signature or maker mark. Hand carved. Gorgeous piece. Has one small chip to its left wing , see photo. 26 1/4 “ by 11.5” Looks stunning hung. Would look excellent in any home or office. I am totally into antique artifacts & paintings. coming into being??. Noorji Handicrafts. It has no markings on it that I could find. A wonderful find for the Antique Italian Angel / Cherub collector. This is a beautiful and substantial Georgian brass bound mahogany gentleman's campaign style dressing box made in Birmingham and hallmarked 1827. Truly spectacular and rare. So much better in person. Large Antique Wood Carving Art Collectible 21" x 12" x 6"
Got at an (very expensive) estate sale a few years ago. Caddy has new green felt underneath. Hinges and lock are original, but no key. Veneer in very nice condition. Several pieces of stringing have been replaced. Brass hinges. Here is an attractive antique box. Antique, early/mid 19th century. Silver-painted inside, which indicates that it possibly was used as a tea caddy. Original varnish is retained, darkened and crackled with the age. Antique 19. century handcarved Chinese Boxwood parasol or walking stick, cane handle. Deep carved flower and bird patterns. We specialize in ceramics, pottery, glass and wooden pieces. COMPLETE WITH CUT CRYSTAL / GLASS MIXING BOWL AND TWIN CANISTER / 2 CONTAINERS LINED WITH SILVER FOLIO. CONDITION IS VERY GOOD CONSIDERING AGE. THE LOCK IS PRESENT BUT I. DON'T HAVE THE KEY - COULD BE MADE VERY EASY. RARE TRINKET BOX. I am totally into antique artifacts & paintings. PRODUCTS ARE EXACTLY THE WAY THEY APPEAR IN THE PICTURES. Good for collection. (Credit Cards). Noorji Handicrafts. I am totally into antique artifacts & paintings. (Credit Cards). Noorji Handicrafts. This unique inlaid wood box dates to the end of the Napoleonic war in 1814. The box is in the form of a book with the drawer holding the history and provenance of the box. It is written on the bottom and sides of the drawer as shown. Antique Document/Letter Box INLAID BOX CHIPPENDALE BRASS HANDLE LOOK! Antique Document/Letter Box with Inlaid design and name ( MARIA SOPHIA SHALLENE).The Box has a gorgeous CHIPPENDALE Brass Handle with 2 interested Handle stops on each side (Super attention to detail throughout this box).Box is in excellent condition and measures 13” long by 4-1/2” tall by 7-5/8” Wide.Cloth lined Interior dimensions are 12-3/4” long by 6-3/4” wide by 3” tall.Fantastic Antique box! Made from quality hardwoods with loving care! Red Oak, Walnut Cherry Woods. Shipped carefully priority mail insured. Circa 1850, likely used for military purposes. You can see the area of spilled ink, and I can imagine an officer making a hasty retreat from battle and the ink spilling in the process. There is a side drawer that extends nearly the length of the desk. JEWELER FERNANDINO. CARVED WOOD. SPAIN. XIX CENTURY. JEWELER FERNANDINO. CARVED WOOD. XIX CENTURY. STYLE FERNANDINO. ESTILO FERNANDINO. BIJOUTIER FERNANDINO. JOYERO FERNANDINO. PERIOD XIX CENTURY. Gorgeous 1800s ANTIQUE Wood CARVED Flower KNICK KNACK Storage BOX _ MINT! Knick Knack Box. early 1800s. (Dallas, Texas). Gorgeous Original. Antique Wooden Storage Box. Discovered this beauty while clearing out family storage. exterior height approx 2-3/4". width approx 8". The trim is finished with inlaid satinwood. The brass carry holds and decorated bun feet are original. 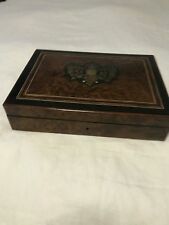 Quality made Mahogany Jewelry valet dresser box. Small brass hinged handled drawers. Blue velvet lining. Stamped "MADE IN JAPAN". Between 1790 and 1830, in the height of the Napoleonic Wars and conquests, this rare Officer's field vanity 'necessaire' or toiletries casket was made. Prior to this era, the Palais Royal, as the site was known, hosted Royals and dignitaries from around the world, and was not only a site for the finest goods to be had, but also a center of theatre and dining. A sheet underneath the fabric interior lining in the lid shows the city of Bern, Switzerland with the date of 11 May 1835. Circa 1800's birch bark tobacco box in very nice shape. The bark overlap in front makes a nice design. Cover fits nicely with a wooden handle. See our entire collection of antiques on our. com website at OldWorldHeirlooms. Box opens by sliding the lid to the right. Item has a wooden top and inside, and brass ball feet / plating. The floral motif around the underside of the box adds to the beauty of the piece. Sold as is. Antique italian 19. Century wood sculpture. A real angel without wings. Beautiful putto. This sculpture is a very complex and difficult composition. Although there is no mark or signature of the artist, only a well skilled and very well educated sculptor were able to create such a masterpiece. A fine English Colonial Indian jewelry box in ebonized wood inlaid with mother of pearl, circa 1850. The box is 12 1/4" wide by 9 1/4' deep by approx. In very good overall condition. There is mother of pearl inlay on the top and front of the box which is 99% intact. Great Find!, a Box but what a box. It appears to be made of pressed Birch Bark, very intricate detail. May have been a snuff box. Very well made and very expensive for 150-200 years ago. Review all Photos. Papier Mache Writing Box by Jennens & Bettridge with beautiful mother of pearl inlays. The base is stamped Jennens & Bettridge Makers to the Queen. Jennens & Bettridge. They were based in Birmingham, but opened branches in London and eventually Paris and New York. The box is decorated with beaded details and a mother of pearl inlays. The chest has two doors which open to reveal three drawers with mother of pearl handles. The chest has two locks. The keys for the locks are missing. An very rare and unusual shaped bombe Dutch early 1800 wooden box. Burled and inlaid wood with a ornate rosette with round handle. Small brass round feet, all four in a perfect condition. There is the original lock but the key is not original and not working well.